Thomas the Tank Engine is my son’s favourite TV programme, and that naturally means it had to become mine too. At the moment, I got to the point in which I can stand Thomas’ voice without feeling like screaming, and to me that is progress. But if you have never seen Thomas, bear with me for just a little longer (and consider yourself lucky). 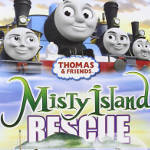 In one feature-length movie called “Misty Island Rescue”, the Fat Controller (in short, Thomas’ boss) compliments Thomas on his ability to take good decisions, which in hindsight turns out to be a mistake. From that moment on, Thomas goes around repeating to himself “I make good decisions, that’s what I’ve been told, I will not be fearful, I’ll be brave and bold.” every time his poor decision making lands him in trouble, which amounts to dozens of times throughout the whole 60 minutes movie, and somehow seem to increase at every watch. 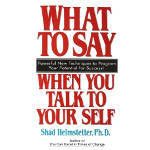 The reason I’m writing about Thomas is because I found myself thinking about that movie while reading a book called “What To Say When You Talk To Yourself”, another jewel of self-help literature I recently added to my library. Some folks like nothing more than ridicule people who–like me–believe that one can better oneself by following the advice a book. To that I say, why not? I became a better parent by following the advice I read on a heap of books, why shouldn’t the same principle apply to me? Well, they can keep laughing, I still prefer to believe we have the ability to improve ourselves, because the alternative is just too depressing. Coming back to the book, its premises are really simple: our self-talk, the way we talk to ourselves, affect who we become and what we will be able to achieve. It’s based on the principle of self-affirmation, which is used successfully by sport and business people. It’s not a new idea at all, but as it turned out, athletes and CEOs are not the only people who would benefit from it. Growing up, we learned to distrust what other people tell us, stranger danger and all that, but we tend to trust a lot of what we say to ourselves, and often what we say to ourselves not only is wrong, but is also unhelpful. The unhelpful things we tell ourselves often spawn from the offhand opinions of important people in our youth, like our parents calling us “lazy-bones”, or overhearing our teacher telling our parents that we are “unable to focus”. I remember to this day the discouraging comments I heard growing up, and for a very long time, I believed them. What about Thomas then? In the story, the Fat Controller makes a simple comment on Thomas’ ability to make decisions and Thomas immediately believes it as true (against all practical evidence), in the same way any young child would. Why not take advantage of that, then? We could become more intentional in the way we talk to our children and use positive affirmation to build a better self-image of themselves. Simple phrases like “You are a kind and gentle child”, reused long enough, can have a huge impact on the opinion a child secretly hold of himself, of which we might not be aware at all. This is what we parents do. We make sure our children know how important they are, not just for us, but just are. Suggesting the right script for their internal dialogue is another way to set them on the right path and, with any luck, in time it won’t be just a script anymore, but what they’ll become in reality. Click on the book cover to purchase a copy of the book, at no extra cost to you, and help support this website! Click on the DVD cover to purchase a copy of the movie, at no extra cost to you, and help support this website! Diego Boccaleone is currently trying to figure out what it means to be a dad. Ben, the son he adopted a few years ago, is still a little puzzled about this figure that often wanders in the house, who insists on talking to him in Italian. He loves music, still strive to find time for movies, and only recently learned to appreciate Winnie The Pooh. Follow him on Twitter @diegoboccaleone and on Facebook. I’ve tried something similar once, while sitting all together at the table. Now, asking for 3 things that made the children happy was more than what they could handle, so I limited the question to 1 thing only, and to be honest I had to suggest both of them an answer. But I’m sure that if we keep it up, and with some more suggestions on our side, they will eventually grasp the idea. It’s a great way to become more aware of the positive things that happen to all of us every day. And if it becomes part of our rituals, the children will be the first ones to bring it up as soon as we sit at the table. They’re such creatures of habits! When I became a father I realised how much I still remember of what my own parents use to say to me. A lot of it are phrases that I surprise myself saying to my child, the same way my parents used to say to me. I do believe that what we tell our children become their inner voice, and it might stay with them for longer than we think. Thank you for your comment! Nice to meet another Thomas fan! I never thought of bringing it up myself 🙂 it just came to mind. I’m terrified that, from now on, my only point of reference will be Thomas, Peppa Pig, and Dora the Explorer. TwinklyTuesday is one of my favourite linkies, thank you for running it! I do sometimes catch myself saying things and realise that it may have more of an impact than just being a flippant comment said in the moment. Luckily we don’t get subjected to much Thomas in this house though – my daughter likes the books and trains but she doesn’t ask for it on the tv – yet! I agree with you. There is no telling how a playful comment might be received by a young child. I think it is more a matter of balancing the bad with the good. I try to use every change to build up my child self image, to mitigate for the many times I say the wrong thing and possibly not even realise it. Much as i despise the over-egged moralising of Thomas The Tank Engine you are right about the internal dialogue and how we train ourselves to believe that voice in our head. I have never thought that telling my children they are good at something or have potential would make them arrogant or spoilt in some way. I think many adults, especially in England, have a cultural complex about giving ‘too much’ praise. Children need so much building up and are so easily prone to self-doubt I don’t think you can tell them enough they are loving and loved. And maybe one day they will grow up to be ‘really useful’ too! I don’t get the fascination with Thomas either, but it has its uses. The ‘being really useful’ ethics is something my son clearly took to heart. Occasionally, I introduce requests with “You know how you could be really useful?”, followed by something as tedious as tiding up his room. Shameful, but it works every time. I suspect that is because being useful is depicted as positive in almost every Thomas episode. As a parent, I find repeating myself a lot, the least I can do is to make sure that what I keep repeating has the right message in it. Thank you for your comment.